It can be a challenge to live on a fixed income. When this is combined with the costs of medical care or prescriptions, it can be hard to make ends meet. You should contact your creditors and ask them for more time to pay or for a change to your interest rate. You should do this as soon as you know you are having trouble paying your bills. Creditors are more likely to work with you if you have been up-front with them and let them know you are having difficulties. If you agree to a payment schedule, be realistic. Do not promise more than you can pay, or promise to make payments that are too large. Set a budget. If you need help doing this, you might ask for help from your local senior center. Certain banks have financial education information on-line or in booklet format in their branches –see if this information can help. If you need more serious help, consider a credit counselor. Beware of consumer credit counselors who charge large fees or make promises which sound too good to be true. Check them out with the Better Business Bureau or with the United States Trustee’s office. The United States Trustee Program approves credit counselors for people filing bankruptcy. The UST web-site lists approved credit counseling agencies and also has Frequently Asked Questions regarding this type of assistance. www.usdoj.gov/ust. Be aware that if you file for bankruptcy, you will be required to complete credit counseling before you can file. Be very cautious about debt consolidation loans. If the interest rate is too high, you could just be digging yourself into a deeper hole. In addition, home equity lines can put your home at risk, which simple credit card debt may not do. What happens if I just don’t pay my bills? Some bills are more important than other bills. Home mortgages and car loans are generally secured. This means that you have agreed to let the creditor take, or repossess, your home or your car if you don’t make the payments. Since you voluntarily permitted the creditor to take a security interest, you cannot rely on homestead exemptions or similar protections to prevent the creditor from taking back its security. Other bills, like most credit card debt, are unsecured. If you fail to pay this type of debt, the creditor can sue you for the amount owed and obtain a judgment. The creditor can use that judgment to garnish wages, attach assets and attempt to collect the amount owed to it. Unsecured debts are subject to state exemption laws, meaning, there are certain things in Nevada, which the Legislature considers necessary for a person to live. In Nevada, an unsecured creditor cannot enforce a lien against your house unless you have more than $550,000 in equity. (Equity is the amount the house is worth after deducting the amount of any mortgage or taxes owed against it.) Social Security and certain Veterans benefits are exempt from bank garnishments. You can exempt up to $1,000 of otherwise non exempt funds from a bank garnishment. 75% of your weekly wages are exempt and all wages below 50 times federal minimum wage are exempt (as of January 1, 2009 the minimum wage is $5.85 x50=$292.50. Exempt wages remain exempt when you put them in your bank account if traceable. There are many other exemptions under Nevada law. If a creditor has a judgment and is attempting to collect on that judgment, you need to consult a lawyer to assist you in preserving these exemptions. In most cases, if you do not have a regular income and all of your assets are exempt under the law, it may not make sense to file bankruptcy. You are what is called “judgment proof”. This means that even if you are sued and the creditor obtains a judgment, the creditor cannot make you pay the judgment because of the protection of asset exemptions. However, if you have assets over the exemptions, or you owe secured debt, you may want to look into filing for bankruptcy protection. This decision is a complex one and you should be assisted by an attorney who can guide you in the right direction. 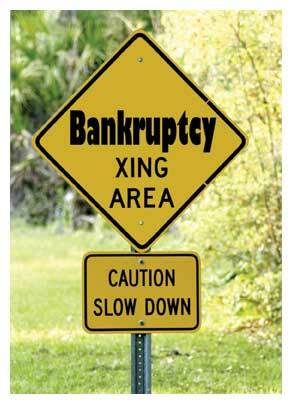 Be very careful about services which advertise that they can help you prepare bankruptcy forms for a very low price. These services are prevented by law from giving legal advice. This means that you are probably not going to get the benefit of the exemption laws. It also means that you could do something which will harm your ability to discharge your debts –which is why you are filing for bankruptcy in the first place. Can I stop bill collectors from hounding me? Can a creditor take my Social Security payments? Social Security proceeds are not generally subject to collection by creditors. Make sure you can trace your social security and other exempt funds when you place them in an account with non exempt funds. Can I lose my home if I don’t make payments? Many current mortgages are sub prime mortgages and may contain what may be considered predatory terms such as adjustable interest rates and teaser rates which call for large increases in monthly payments after a few years. Even if you have a loan which seems unfair your home can still be foreclosed upon. If you discover that you have a loan that you will not be able to afford in a few years, please see an attorney as soon as possible. There are additional options you can pursue if you cannot afford your loan. Most lenders will allow you to conduct a “short sale” (a sale in which the purchaser pays less than you owe) and release you for the unpaid portion of the mortgage. This forgiven debt will be considered income by the IRS but may be waived. See a housing counselor or tax advisor to help you. If your payments are high but you have sufficient equity, refinancing into a new loan or into a reverse mortgage (see making ends meet section) may be helpful. However avoid rescue scams (see Nevada Attorney General web site http://ag.state.nv.us/main.htm) and if you refinance do not choose your lender based on mailers or telephone solicitations. If you don’t understand the terms, make sure you have an independent and trustworthy person review them with you.